If you are visiting with us for the first time, we would like you to know exactly what to expect. We want to provide you with an experience that makes you feel confident in choosing us to help you feel great again. Our office atmosphere has often been described as warm and professional, with a friendly vibe that makes people feel welcome and supported. We hope you think so, too! Your first visit will take between 30 and 60 minutes. When you enter the office, you will be warmly greeted by one of our friendly staff members. We will invite you to take a seat to complete your new patient paperwork if you have not had a chance to download it from our website. Your visit will conclude with your first gentle chiropractic adjustment. Your second visit will take about 30 minutes. During this appointment, Dr. Kaufman will evaluate your exam and X-ray findings to help you understand the source of your problem. He will then discuss customized treatment options and design a care plan to help you meet your stated health goals. This appointment will end with your second chiropractic adjustment and any additional treatment modalities necessary to help eliminate your pain as quickly as possible. Subsequent visits will take anywhere between 10 and 20 minutes, depending on the therapies used on that day. Our office is very respectful of your time, and you’ll find that our scheduling is streamlined and efficient for your convenience. 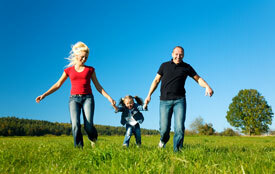 Our goal is to assist you in attaining a lifestyle that is active, and free of the burden of pain. We will be there for you every step of the way, offering a helping hand and a committed partnership. Contact us today; we offer free consultations and are in-network providers.